This device has the potential for immense destruction. Attacks have a 12% chance to apply Firestorm to the target, dealing 600 spell damage to enemies in 200 range over 3 seconds. If this effect is reapplied, any remaining damage will be added to the new duration. If the target dies, any remaining damage is dealt instantly. 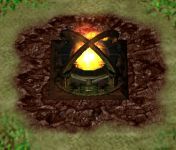 This is the discussion thread for the tower update Damaged Firestorm Generator (1999). The tower has been updated to version v14! The tower has been updated to version v15! The tower has been updated to version v16! The tower has been updated to version v17! also this tower deals splash damage so ability it even 'stronger' then its dps numbers say since it hits multiple enemies on some waves. Are you saying the damage is too high? Only one of them exceeds the "budget"... the damage may be AoE but it is also damage over time which is allowed to be higher, no? The tower has been updated to version v18! Post subject: Update to version v19! The tower has been updated to version v19!